There are some classics when it comes to Halloween costumes, and certainly one of the most popular – for centuries – has to be costumes of vampires. One of the things that makes these costumes so popular is that both adults and kids can easily dress up as a vampire with items they can find around the house. It’s a fairly simple costume, and one that everyone will immediately recognize. What do I mean? Well, by romance, I mean you want to focus on the “romantic allure” of the vampire. The vampire should look handsome if they’re male, and beautiful if they’re female. They should be dressed in sharp clothing (not rags). Hair styling is important. Clothing should be elaborate but not tacky. And by Transylvania, I mean the costume should be dark – both figuratively and metaphorically speaking. Pick black clothing. A cape is always good as well. Go for something old-fashioned looking (not current day clothing). Accessories should reflect the Old World – think cane, cape, vest. Now, for those kids that are wanting to dress up as a vampire for halloween, their costume choices are going to be very similar to those of adults…they’ll just come in mini versions. The best advice for kids vampire costumes is to keep it classic and simple. A smiling version of dracula looks fantastic on a kid, and will probably go off much better and look cuter than a version of a vampre covered in blood. Kids should be innocent and carefree, and their costumes should reflect this. Check out the image of the kid vampre on my right. Would it be better if his face was smeared with blood? Not really! 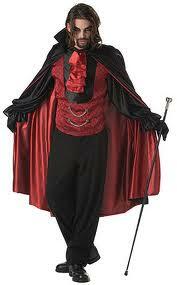 If you want to go all out traditional, then the costume that you are probably looking for is that of Count Dracula. 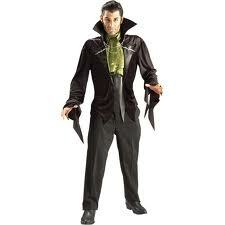 To get a good dracula costume, you’ll want to have a popped up collar that encircles the head (see image below). A cape is also traditional. Be sure to dress in all black. Hair slicked back enhances the look as well. Perhaps however one of the most important things in the dracula vampire costume is going to be the makeup – you want the face to appear menacing and somewhat evil – hollow out the eyes with a dark black or brown to make them look sunken and shadowed…make the face skin pale with some what makeup…redden your lips, and for a touch of drama add a drip of blood right at the corner of the mouth. And speaking of the mouth – don’t forget some razor sharp plastic fangs to complete the look! If you’re looking for more vampire costumes, you can always try something more modern like a Fright Night Vampire Costume! 2 Cute kids Halloween costumes on Vine!